Shade garden tips for the real challenge comes from a law of nature that all plants need some form of sunlight to grow. Certain plants require full sunlight, meaning constant exposure to sun for around 8 hours a day, while many can grow with less exposure to the sun. For some shade tolerant plants, full exposure to sun is not mandatory, dappled sunlight or patches of exposure at different times of day are just a good. There are also plants that can make do with just reflected light. Apply the gardening tips given here for starting shade gardening, or for ideas to enhance an existing garden with the use of shade plants and flowers. Your garden may be in a shady area for many reasons, it could be shade caused by your house, walls or fence, or it could be due to shade from tall trees or shady hedges in the garden. To design a shade garden the first of these shade garden tips is the need to understand the difference between types of shade. The shade from a house or fence is typically constant and can be classified as full shade; it does not change very much during the day as the sun moves round. The shade under trees varies a lot during the day and at different times of the year. You must choose your plants carefully to make the most of this varying shade. For the full shade garden or backyard garden you can look at options for pot gardening and rotating your container plants to make good use of the space and yet provide your plants with sufficient sunlight. It is crucially important to choose the right sort of plants for the shady area of your garden: under an over-hanging roof, under trees, in the shade of your house or garden shed. Fortunately, there are plenty of plants for shade gardening so you will be able to create a nice garden design even in places with low sunlight conditions. Examples of just a few shade garden plants you can use are; Astilbe, Coral Bells, Lily of the Valley, Oriental Poppy, Foxtail Lily, Butterfly Plant, and Astrantia. All these beautiful plants are meant to bring the touch of color and elegance to the shaded parts of your garden. Soil conditions in shade areas can vary a lot during the day and even over the course of the year. It is always best to have a controlled environment to give your plants the best growing conditions. In this regard garden mulches are great to use as part of a garden design. Mulch has many benefits; it retains moisture content in the soil, prevents weed growth, and many shady tolerant plants are used to growing among types of mulch. Will you be able to protect your plant, especially in winter season? Some plants are quite hardy, while the others are more delicate, with no resistance to winter frosts, so it might be necessary to keep them indoors for a few weeks. Another crucial aspect is your climate zone. Depending on a climate zone, the same plant may require different methods of care and maintenance. Most shade loving plants can be found in the wild (Native Plants), and it is essential to replicate their needs if you choose to plant them in your garden. Shade garden tips include making sure that Ph. of the soil and the soil type is just right, as well as light and moisture conditions. Some plants have a tendency to spread very aggressively. It is better to decide in advance whether you can use this tendency to your advantage or whether aggressive spreading plants will only create problems. Naturally, it is better to choose plants with a high level of disease resistance and try to find out whether they are susceptible to gardening pests and insect damage. If the answer is yes, shade garden tips advises to be prepared for garden pests or disease so you can take immediate action when needed. Some plants are rather sensitive to other species that grow nearby, and on the other hand there are plants that benefit from being close to each other, called companion planting. It is important to know plants preferences prior to planting, especially if you are planning to create a composite flower bed with lots of different plants. It is always best to choose plants native to your area. Native plants require much less maintenance and are more likely to flourish. When selecting plants for shade gardening, you should not concentrate just on perennial shade flowers as there are lots of ornamental ground cover plants with really beautiful leaves along with some amazing perennial shrubs to choose from. Although you may not be able do very much about controlling direct sunlight you can control the reflected sunlight in your garden. Use light colours, or even white, for your fences and walls to reflect sunlight. If your garden is large enough for a stone pathway you can use light coloured stones for reflection. If the garden is not big enough, then add some decorative light stones around your flower and vegetable beds to reflect light. Decorative stones can give your garden a more natural look at the same time as helping to reflect light. Outdoor solar lights are brilliant for brightening up your garden during the evening and night. If you cannot get the ideal plants for full shade areas of your garden try using arrangements of stones instead. Shade garden tips suggests that large ornamental stones placed in well-chosen positions can add interest and focal points in a garden. 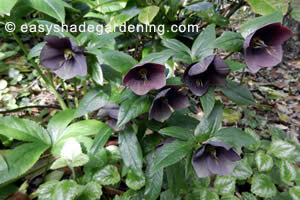 Try to place them in darker to more shady areas to get maximum benefit. That way your garden will not look empty and the stones can add class to your garden design. You can also design a walk way to go through shady gardens where possible. 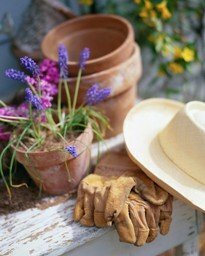 Check out some Rock Garden Ideas. Pot gardening makes plants mobile. This is important in shade gardening because with mobile container plants you do not have to plan your plant positions strictly by shade considerations. You can give your garden a better overall appearance by placing certain potted plants in areas where they typically won’t grow. If they are potted you can move them around on a regular basis to give them good growing conditions such as sunlight and still retain the charm of your garden. See General Gardening Tips for information about general care such as deadheading, dividing plants, pinching out tops, fertilizing, the benefits of weeding and watering, and being considerate to wildlife, and birds.